A well-known name in the radiator industry, Radiator Outlet, has recently revealed that it is now offering an impressive collection of designer radiators in UK with a 10 year warranty. The radiators the company offers are manufactured employing cutting-edge technological tools to ensure they create a much better appearance and are more efficient than standard radiators. The wide range of designer radiators they offer include 635 x 415mm Anthracite Single Oval Tube Horizontal Radiator, 1600 x 236mm Anthracite Single Oval Tube Vertical Radiator, 635 x 420mm Anthracite Single Flat Panel Horizontal Radiator, 635 x 595mm Anthracite Single Oval Tube Horizontal Radiator, 1600 x 280mm Anthracite Single Flat Panel Vertical Radiator and many others. Individuals planning to bring home designer radiators can count on this reputable firm for their needs. The HeatSave wireless programmable thermostatic radiator valves work with the majority of radiators available on the market (either directly or via a dedicated adapter) and allow users to attain even higher savings in terms of energy and bills, of up to an impressive 30 percent. 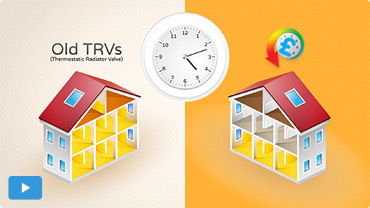 They are extremely easy to set-up and install, since one will only have to unscrew the existing TRV by hand and replace with the HeatSave wireless radiator valve. Furthermore, the user friendly, web-based HeatingSave software lets you wirelessly check and control individual radiators from any smartphone, tablet or laptop. This feature will allow you to turn down the heating in rooms that you’re not using and one can also easily plan up to four years in advance for times when the heating will not be in use with the heating holiday diary, while the ‘hands on’ override button on the valve means quick changes are easy from within the room. If you want to find out more about the HeatSave wireless thermostatic valves, just contact our dedicated product team, or if you’re ready to get one for yourself, you can visit our retail partners and get one for yourselves. HeatSave™ 589 Great North Road, St Neots, Cambridgeshire. PE19 7GJ Tel: +44 (0)1480 223923. All content © 2014 HeatSave.